This product embraces the exterior design with the concept of a racing car in mind, and a built-in RGB lighting design for the gaming keyboard and look of the product to enable more personalized settings. The sound effects have also been significantly improved to meet the needs of PC gamers for them to get more immersed in the game worlds. 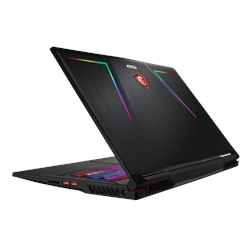 MSI GE73 Raider RGB is inspired by sports cars and the RGB master race, perfectly crafted for ultra-illumination: top cover, keyboard, and even USB port lighting. Through the introduction of the new Gaming Mode, the intuitive lighting can be set to in-game information, offering players greater awareness of the action. With rich gaming features and astonishing performance, the GE73 Raider RGB shows the next mile of gaming notebook evolution.